Advanced tread compounding provides this Eco Plus version with 20% less rolling resistance than the HDR2. 30/32” tread is compounded for low rolling resistance with long tread life used on highway and regional roads. 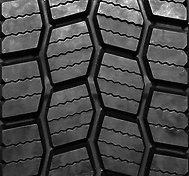 Open shoulder tread design provides excellent wet/dry traction while resisting irregular wear. Innovative lug angles minimize stone retention and casing penetrations, improving retreadability. Applications: Drive position, regional hauling on highway service.